Dog breeds are dogs that have relatively uniform physical characteristics developed by humans, with breeding animals selected for phenotypic traits such as size, coat color, structure, and behavior. The Fédération Cynologique Internationale recognizes 337 pure dog breeds. The domestic dog is the first species, and the only large carnivore, to have been domesticated. Over the past 200 years, dogs have undergone rapid phenotypic change and were formed into today's modern breeds due to artificial selection imposed by humans. These breeds can vary in size and weight from a 0.46 kg (1.0 lb) teacup poodle to a 90 kg (200 lb) giant mastiff. The skull, body, and limb proportions vary significantly between breeds, with dogs displaying more phenotypic diversity than can be found within the entire order of carnivores. Some breeds demonstrate outstanding skills in herding, retrieving, scent detection, and guarding, which demonstrates the functional and behavioral diversity of dogs. The first dogs were certainly wolflike, but the phenotypic changes that coincided with the dog–wolf genetic divergence are not known. In 2017, a study showed that 9,000 years ago the domestic dog was present at what is now Zhokhov Island, arctic north-eastern Siberia, which was connected to the mainland at that time. The dogs were selectively bred as either sled dogs or as hunting dogs, which implies that a sled dog standard and a hunting dog standard existed at that time. The optimal maximum size for a sled dog is 20–25 kg (44–55 lb) based on thermo-regulation, and the ancient sled dogs were between 16–25 kg (35–55 lb). The same standard has been found in the remains of sled dogs from this region 2,000 ago and in the modern Siberian Husky breed standard. Other dogs were more massive at 30 kg (66 lb) and appear to be dogs that had been crossed with wolves and used for polar-bear hunting. At death, the heads of the dogs had been carefully separated from their bodies by humans, probably for ceremonial reasons. Between 3,000 and 4,000 years ago greyhound-type dogs were depicted on pottery and paintings in Egypt and Western Asia. Mastiff-type dogs were kept for guarding and hunting, and short-legged dogs were also bred. Most modern dog breeds are the products of the controlled breeding practices of the Victorian era (1830-1900), and the accurate documenting of pedigrees with the establishment of the English Kennel Club in 1873 in imitation of other stud book registries for cattle and horses. For early depictions of dogs in art, see early history in art. Domestic dogs are the most variable of mammals. Strong artificial selection has developed around 450 globally recognized breeds. These breeds possess distinct morphological traits including body size, skull shape, tail phenotype, fur colour and fur type. They also possess behavioral traits including herding, guarding, and hunting, in addition to personality traits such as aggression, boldness, or hypersocial behavior. Most of these breeds were developed within the last 200 years using only small numbers of founders. As a result, the large phenotypic variation across dog breeds can be studied through the analysis with only a small number of genetic markers. Ancient breed of dogs was a term once used for a group of dog breeds by the American Kennel Club, but no longer. These breeds were referred to as "ancient breeds", as opposed to modern breeds because historically it was believed that they had origins dating back over 500 years. In 2004, a study looked at the microsatellites of 414 purebred dogs representing 85 breeds. The study found that dog breeds were so genetically distinct that 99% of individual dogs could be correctly assigned to their breed based on their genotype, indicating that breeding barriers (pure-bred breeding) has led to distinct genetic units. The study identified 9 breeds that could be represented on the branches of a phylogenetic tree which grouped together with strong statistical support and could be separated from the other breeds with a modern European origin. These 9 breeds had been referred to as "ancient breeds", as opposed to the modern breeds. The study found that the Pharaoh Hound and Ibizan Hound were not as old as believed but had been recreated from combinations of other breeds, and that the Norwegian Elkhound grouped with the other European dogs despite reports of direct Scandinavian origins dating back 5,000 years. The dog which accompanied the ancestors of Native Americans from Siberia is extinct. "Five different types of dogs," c. 1547. 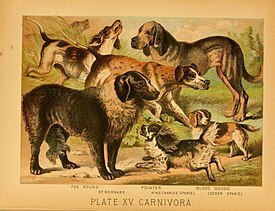 The spread of modern dog breeds has been difficult to resolve because many are the products of the controlled breeding practices of the Victorian era (1830–1900). In 2010, a study looked at 48,000 single nucleotide polymorphisms that gave a genome-wide coverage of 912 dogs representing 85 breeds. The study found distinct genetic clusters within modern dogs that largely corresponded to phenotype or function. These included spitz-breeds, toy dogs, spaniels, Mastiff-like breeds, small terriers, retrievers, herding dogs, scent-hounds, and sight-hounds. There were 17 breeds that conflicted with phenotype or function and these were thought to be the result of crossing some of the other phenotypes. As in a 2004 study that found 9 ‘ancient breeds’ to be genetically divergent, the study found 13 breeds that were genetically divergent from the modern breeds: the Basenji, Saluki, Afghan hound, Samoyed, Canaan dog, New Guinea singing dog, dingo, Chow Chow, Chinese Shar Pei, Akita, Alaskan malamute, Siberian husky and American Eskimo dog. Results also indicated that the Basenji had recent admixture with Middle Eastern wolves. a northern group (Alaskan Malamute and Siberian Husky). In 2012, a study looked at 49,000 Single nucleotide polymorphisms that gave a genome-wide coverage of 1,375 dogs representing 35 breeds, 19 wolves, and previous published genetic signatures of other breeds, giving a total of 121 breeds covered. The study found a deep genetic split between old-world and new-world wolves, and confirmed the genetic divergence of 13 breeds from a 2010 study (Afghan Hound, Akita, Alaskan Malamute, American Eskimo, Basenji, Canaan dog, Chow Chow, Dingo, New Guinea singing dog, Saluki, Samoyed, Shar-Pei, Siberian Husky), plus another 3: the Eurasier, Finnish Spitz and Shiba Inu. The study referred to these 16 as Basal breeds, as opposed to ancient breeds, as they exhibited genetic divergence but not all of them were historically considered to be "ancient breeds". The 2012 study found that modern breeds only emerged in the 19th century and that claims of their antiquity are based on little or no historical or empirical evidence. The study indicated that throughout history, global dog populations experienced numerous episodes of diversification and homogenization, with each round further reducing the power of genetic data derived from modern breeds to help infer their early history. Of the basal breeds, the American Eskimo Dog and Eurasier were the very recent product of cross-breeding other basal breeds. Most basal breeds have hybridized with other lineages in the past. If those other lineages were other basal breeds then a basal genetic signature remains. The combination of introgression and past population bottlenecks suggested that basal breeds have little or no genetic connections to their ancestral populations and that their genetic distinctiveness does not signify ancient heritage. They are distinctive from the modern breeds because the genetic heritage of the modern breeds has become blurred due to admixture, and the basal breeds have mostly avoided admixture with them due to geographic or cultural barriers. In 2014, a study indicated that some breed-temperaments, such as anxiety or fear, may be linked to gene mutations. Other temperaments may be due to the legacies of 'ancient' ancestry. Groups of owners that have dogs of the same breed and have an interest in dog breeding can form national Kennel clubs. Kennel Clubs maintain breed standards, record pedigrees in a breed registry (or studbook), and issue the rules for conformation dog shows and trials and accreditation of judges. They often serve as registries, which are lists of adult purebred dogs and lists of litters of puppies born to purebred parents. A dog breed is represented by a sufficient number of individuals to stably transfer its specific characteristics over generations. Dogs of same breed have similar characteristics of appearance and behavior, primarily because they come from a select set of ancestors who had the same characteristics. Dogs of a specific breed breed true, producing young that are very similar to their parents. An individual dog is identified as a member of a breed through proof of ancestry, using genetic analysis or written records of ancestry. Without such proof, identification of a specific breed is not reliable. Such records, called stud books, may be maintained by individuals, clubs, or other organizations. Kennel clubs provide the recognition of distinct dog breeds, but there are many independent clubs with differing, and sometimes inconsistent standards and they need not apply scientific standards. Four varieties of the Belgian Shepherd Dog are recognised as four distinct breeds by the New Zealand Kennel Club. Further, some groups of dogs which clearly share a persistent set of characteristics and documented descent from a known foundation stock may still not be recognized by some clubs as breeds. For instance, the feist is a hunting dog raised in the Southern United States for hunting small game. Feists have a consistent set of characteristics that reliably differentiate them from other dog types and breeds. However, the United Kennel Club recognizes one breed of feist, the Treeing Feist, while the American Kennel Club does not recognize any feist breed. A dog is said to be purebred if their parents were purebred and if the dog meets the standards of the breed. Purebred dog breeders of today "have inherited a breeding paradigm that is, at the very least, a bit anachronistic in light of modern genetic knowledge, and that first arose out of a pretty blatant misinterpretation of Darwin and an enthusiasm for social theories that have long been discredited as scientifically insupportable and morally questionable." Morally questionable policies regarding purity of breed include obligatory surgical procedures to spay or neuter animals in numerous contexts. The American Kennel Club, for instance, allows mixed-breed dogs to be shown but requires these animals to be altered. It doesn't make such requirements for purebred dogs. California Assembly Act AB 1634 was a bill introduced in 2007 that would require all non-working dogs of mixed breed over the age of 6 months to be neutered or spayed. The bill was morally controversial, leading the American Kennel Club to fight the bill. The Canadian department of agriculture has strict standards for the documenting of what it calls "evolving breeds". The breed standard for each breed of dog is a detailed description of the appearance and behaviour of an idealized dog of that breed. Included in the breed standard description are externally observable aspects of appearance and behaviour that are considered by the breed club to be the most important for the breed, and externally observable details of appearance or temperament that are considered by the breed club to be unacceptable (called faults). In addition, most breed standards include a historical section, describing the place of origin and the original work done by the breed or its ancestor types. Dogs with a breed standard may be accepted into one or more of the major registries (kennel clubs) of dog breeds include the Fédération Cynologique Internationale (covering 84 countries), The Kennel Club (UK), the Canadian Kennel Club, the American Kennel Club, the United Kennel Clubs International, the Australian National Kennel Council the New Zealand Kennel Club, and other national registries. The registry places the breed into the appropriate category, called a group. Some Groups may be further subdivided by some registries. Pure breed dogs have more health problems than mongrel dogs, and require more veterinary visits, and tend to have lower longevity. Indeed, studies have reported lifespans that are shorter by between one and almost two years. Notably, dog breeds with flat faces and short noses have breathing difficulties, eye trouble and other health issues. The Fédération Cynologique Internationale recognizes over 300 dog breeds. A dog crossbreed is the result of mating two different breeds. A mongrel, mixed-breed dog or mutt is a dog that does not belong to one officially recognized breed and is not the result of intentional breeding. Natural breeds rose through time in response to a particular environment and in isolation from other populations of the species. This environment included humans but with little or no selective breeding by humans. Dog types are broad categories of dogs based on form, function or style of work, lineage, or appearance. In contrast, modern dog breeds are particular breed standards, sharing a common set of heritable characteristics, determined by the kennel club that recognizes the breed. Examples include the huntaway and other livestock dogs of New Zealand, the feist dogs of the southern United States, and the Patagonian sheepdogs of Argentina, which are collies mixed with other working dogs. ^ Irion, D (2003). "Analysis of Genetic Variation in 28 Dog Breed Populations With 100 Microsatellite Markers". Journal of Heredity. 94 (1): 81–7. doi:10.1093/jhered/esg004. PMID 12692167. ^ Freedman, Adam H; Wayne, Robert K (2017). "Deciphering the Origin of Dogs: From Fossils to Genomes". Annual Review of Animal Biosciences. 5: 281–307. doi:10.1146/annurev-animal-022114-110937. PMID 27912242. ^ Pitulko, Vladimir V.; Kasparov, Aleksey K. (2017). "Archaeological dogs from the Early Holocene Zhokhov site in the Eastern Siberian Arctic". Journal of Archaeological Science: Reports. 13: 491–515. doi:10.1016/j.jasrep.2017.04.003. ^ a b Wilcox, Bonnie; Walkowicz, Chris (March 1995). Atlas of Dog Breeds of the World (Print) (5th ed.). Neptune City, NJ Lanham, MD: TFH Publications, Inc. p. 912. ISBN 978-0793812844. ^ a b c American Kennel Club (2006). Complete Dog Book. Ballantine Books; 20 edition. ISBN 978-0345476265. ^ Clark, Annie Rodgers; Brace, Andrew H. (1995). The International Encyclopedia of Dogs. New York: Howell Book House. p. 8. ISBN 978-0-87605-624-0. In the strictest sense, dog breeds date back only to the last couple of decades of the nineteenth century, or to more recent decades in this (the twentieth) century but distinct types of dogs have existed centuries earlier. ^ Ostrander, Elaine A.; Wang, Guo-Dong; Larson, Greger; Vonholdt, Bridgett M.; Davis, Brian W.; Jagannathan, Vidyha; Hitte, Christophe; Wayne, Robert K.; Zhang, Ya-Ping (2019). "Dog10K: An international sequencing effort to advance studies of canine domestication, phenotypes, and health". National Science Review. doi:10.1093/nsr/nwz049. ^ a b Parker, H. G.; Kim, L. V.; Sutter, N. B.; Carlson, S; Lorentzen, T. D.; Malek, T. B.; Johnson, G. S.; Defrance, H. B.; Ostrander, E. A.; Kruglyak, L (2004). "Genetic Structure of the Purebred Domestic Dog". Science. 304 (5674): 1160–4. Bibcode:2004Sci...304.1160P. doi:10.1126/science.1097406. PMID 15155949. ^ American Kennel Club. "Dog breed groups". ^ Máire Ní Leathlobhair and about 50 others (6 July 2018). "The evolutionary history of dogs in the Americas". Science. 361 (6397): 81–85. doi:10.1126/science.aao4776. PMID 29976825. ^ Diana Yates (5 July 2018). "First dogs in the Americas arrived from Siberia, disappeared after European contact". news.illinois.edu. University of Illinois. Retrieved 11 July 2018. These dogs persisted for thousands of years in the Americas, but almost completely vanished after European contact, the researchers found. ^ a b c vonHoldt, Bridgett; Lohmueller, Kirk E.; Han, Eunjung; Parker, Heidi G.; Quignon, Pascale; Degenhardt, Jeremiah D.; Boyko, Adam R.; Earl, Dent A.; Auton, Adam; Reynolds, Andy; Bryc, Kasia; Brisbin, Abra; Knowles, James C.; Mosher, Dana S.; Spady, Tyrone C.; Elkahloun, Abdel; Geffen, Eli; Pilot, Malgorzata; Jedrzejewski, Wlodzimierz; Greco, Claudia; Randi, Ettore; Bannasch, Danika; Wilton, Alan; Shearman, Jeremy; Musiani, Marco; Cargill, Michelle; Jones, Paul G.; Qian, Zuwei; Huang, Wei; et al. (17 March 2010). "Genome-wide SNP and haplotype analyses reveal a rich history underlying dog domestication". Nature. 464 (7290): 898–902. Bibcode:2010Natur.464..898V. doi:10.1038/nature08837. PMC 3494089. PMID 20237475. ^ Larson, G (2012). "Rethinking dog domestication by integrating genetics, archeology, and biogeography". Proc. Natl. Acad. Sci. U.S.A. 109 (23): 8878–83. Bibcode:2012PNAS..109.8878L. doi:10.1073/pnas.1203005109. PMC 3384140. PMID 22615366. ^ Cadieu, Edouard; Ostrander, Elaine A. (2007). "Canine Genetics Offers New Mechanisms for the Study of Human Cancer". Cancer Epidemiology, Biomarkers & Prevention. 16 (11): 2181–2183. doi:10.1158/1055-9965.EPI-07-2667. PMID 17982116. ^ Serpell, James A.; Duffy, Deborah L. (2014). "Dog Breeds and Their Behavior". Domestic Dog Cognition and Behavior. p. 31. doi:10.1007/978-3-642-53994-7_2. ISBN 978-3-642-53993-0. ^ Donna L. Morden; Seranne, Ann; Wendell J. Sammet; Gasow, Julia (2004). The joy of breeding your own show dog. New York, N.Y: Howell Book House. ISBN 978-0-7645-7302-6. ^ Lynn Marmer (1984). "The New Breed Of Municipal Dog Control Laws:Are They Constitutional?". first published in the University of Cincinnati Law Review. Archived from the original on 26 September 2000. Retrieved 13 December 2013. The court found it was impossible to identify the breed of an unregistered dog. ^ "Standards of the Breeds: Group 5 – Working" (PDF). New Zealand Kennel Club. ^ Budiansky", Stephen (2000). The Truth About Dogs; an Inquiry into the Ancestry, Social Conventions, Mental Habits, and Moral Fiber of Canis familiaris. New York, U.S.A.: Viking Penguin. p. 35. ISBN 978-0-670-89272-3. ^ "Animal Pedigree Act 1985". Department of Justice, Canada. Archived from the original on 26 July 2012. Retrieved 9 April 2008. ^ Egenvall, A.; Hedhammar, A.; Bonnett, B. N.; Olson, P. (29 April 2000). "Gender, age, breed and distribution of morbidity and mortality in insured dogs in Sweden during 1995 and 1996". Veterinary Record. 146 (18): 519–525. doi:10.1136/vr.146.18.519. ISSN 2042-7670. PMID 11321213. ^ Bonnett, B. N.; Egenvall, A.; Olson, P.; Hedhammar, Å (12 July 1997). "Mortality in insured Swedish dogs: rates and causes of death in various breeds". Veterinary Record. 141 (2): 40–44. doi:10.1136/vr.141.2.40. ISSN 2042-7670. PMID 9253830. ^ Proschowsky, Helle Friis; Rugbjerg, Helene; Ersbøll, Annette Kjær (30 April 2003). "Mortality of purebred and mixed-breed dogs in Denmark". Preventive Veterinary Medicine. 58 (1–2): 63–74. doi:10.1016/S0167-5877(03)00010-2. PMID 12628771. ^ O’Neill, D. G.; Church, D. B.; McGreevy, P. D.; Thomson, P. C.; Brodbelt, D. C. (1 December 2013). "Longevity and mortality of owned dogs in England". The Veterinary Journal. 198 (3): 638–643. doi:10.1016/j.tvjl.2013.09.020. PMID 24206631. ^ Patronek, Gary J.; Waters, David J.; Glickman, Lawrence T. (1 May 1997). "Comparative Longevity of Pet Dogs and Humans: Implications for Gerontology Research". The Journals of Gerontology Series A: Biological Sciences and Medical Sciences. 52A (3): B171–B178. doi:10.1093/gerona/52A.3.B171. ISSN 1079-5006. PMID 9158552. ^ "cross-breed". Oxford Dictionaries. Oxford University Press. 2014. ^ Morris, Desmond (2008). "Feral dogs". Dogs: The Ultimate Dictionary of over 1,000 Dog Breeds (First Paperback ed.). Vermont: Tralfalgar Square. pp. 696–697. ISBN 978-1-57076-410-3. The mongrel is not a true breed, but it is certainly a common category of domestic dog. It has been estimated that, worldwide, there are 150 million of them." ^ Sponenberg, D. Phillip (18 May 2000). "Genetic Resources and Their Conservation". In Bowling, Ann T.; Ruvinsky, Anatoly (eds.). The Genetics of the Horse. Wallingford, Oxfordshire, UK: CABI Publishing. pp. 392–393. ISBN 978-0-85199-429-1. Retrieved 28 September 2014. ^ Coppinger, Raymond & Lorna Coppinger. Dogs. Scribner 2001, ISBN 0-684-85530-5, Chapter 3, "Natural Breeds", p. 85. "Natural breeds can arise locally with no human interaction"
^ Rorem, Linda. "Herding Dog Breeds - Stockdog breeds". Herding on the Web. Archived from the original on 3 December 2013. Retrieved 13 December 2013. Alderton, David (September 2008). Encyclopedia of Dogs (Hardcover). Bath: Parragon Inc. p. 384. ISBN 978-1407524382. Coile, D. Caroline (1 April 2005). Encyclopedia of Dog Breeds: Profiles of More than 150 Breeds (2nd ed.). Barron's Educational Series, Incorporated. p. 368. ISBN 9780764157004. De Prisco, Andrew; Johnson, James B. (1993). Canine Lexicon. T. F. H. Publications. p. 886. ISBN 978-3-929545-60-9. Kister, Kenneth F. (1994). Kister's Best Encyclopedias (2nd ed.). Phoenix: Oryx. pp. 329–330. ISBN 978-0-89774-744-8. De Vito, Dominique (1 September 2005). World Atlas of Dog Breeds (Print) (6th ed.). Neptune City, NJ Lanham, MD: TFH Publications, Inc. Distributed in the U.S. to the Bookstore and library trade by National Book Network. p. 960. ISBN 978-0793806560. DK Publishing (15 July 2013). The Dog Encyclopedia (Hardcover) (1st ed.). DK Adult. p. 360. ISBN 978-1465408440. Wilcox, Bonnie; Walkowicz, Chris (March 1995). Atlas of Dog Breeds of the World (Print) (5th ed.). Neptune City, NJ Lanham, MD: TFH Publications, Inc. Distributed in the U.S. to the Bookstore and library trade by National Book Network. p. 912. ISBN 978-0793812844. Fédération Cynologique Internationale breeds nomenclature, lists 339 dog breeds in 78 groups.